These are totes and purses which I have ready to find a new home. Contact me if you are interested in any of them. pocket 4.5 in deep, one side 3 in wide and the other 5 in wide. I live in suburban Philadelphia. 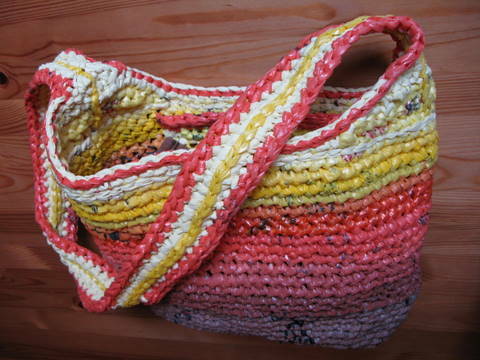 My elder mother has discovered the pleasure of creating plarn and crocheting totes and such from them. This keeps her happily engaged in doing something constructive and not just wasting time watching TV. Have you had success in selling your creations? Where would you recommend my marketing her eco-bags. All the females who love my mom have a bag or two. We use them for grocery bags at the produce stand, wet bathing suits at the pool/beach, and even some doll house rugs, coasters, and a thingy for holding wer sponges and sos pads at the kitchen sink. We get many compliments for their usefulness, yet don’t seem to break into the market….Looking forward to your reply. Roxanna, Sorry to be so late with a reply to your message. I have not been blogging much lately and so appologize for not getting back to you. I have done a lot the same as your Mom – gifting them to my friends and family. My daughter(a graphic designer) made “business cards” for me, so I give them out to people who comment about my plarn purse. Occasionally a friend will want to buy one. I do have a facebook page – bags2bags – and I post my purses on there – have occasionally had someone purchase one that way. I also had a couple of orders from this site. But none have developed much “business”. I have donated some for church boutiques too. My daughter and daughter in law have actually brought the most sales of my purses among their friends. I have thought of opening an etsy shop, but have not followed through with that. I also thought about finding “green” stores or boutiques to see if they would buy any or put them in their stores on consignment. Again, it is something that I have not yet done. Maybe you can make business cards for your mom, and give some to ladies who have her creations, and they can pass them out whenever someone compliments them on their purse. They can say a woman they know makes and sells them, and here is her contact information. Facebook would be the easiest place to have pictures of some she has done – both ones for sale, and ones she has gifted to ladies. I have both posted there, and tell people they can special order one, and I will try to do it similar to one pictured. I also ask for $10 before I start a special order purse, and that this is not refundable if you decide not to purchase it after it is completed. When I mail them, I used gift boxes from stores – you can get this time of year! They are light weight, so save on postage. I have used USPS to mail them, and it costs about $5 for a regular size purse, $7 for a larger sling strap purse, and $10 for a tote, so that is what I have people pay in addition to the purse cost. I use a black marker and write over the store name – recycle. 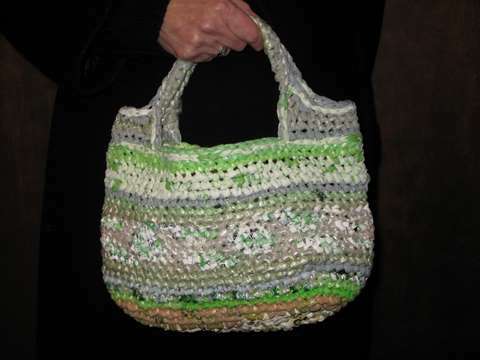 Do you have pictures of any bags your mom has made? I would love to see them. I don’t know how helpful this was. I hope you will find a place for her to market her purses and things. 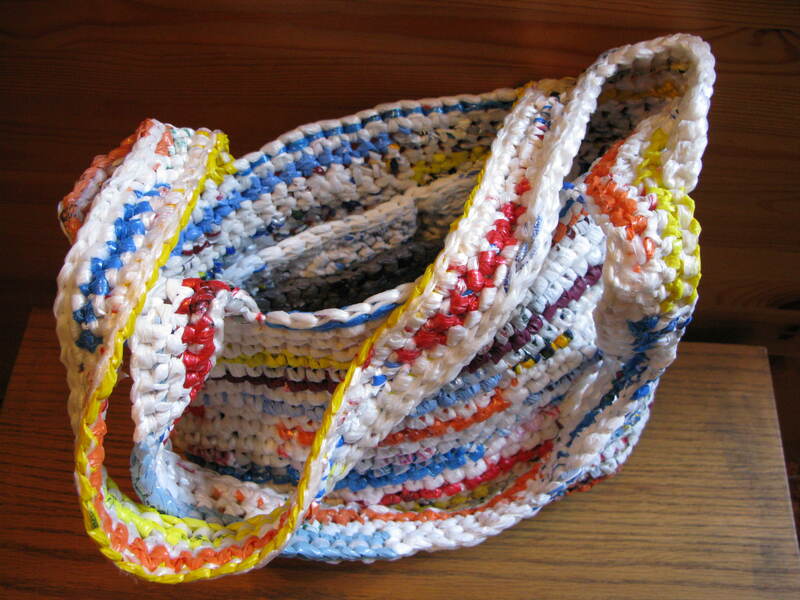 I talked with a lady the other day who said she made rugs for RV’s with plarn and people loved that! I might give it a try! 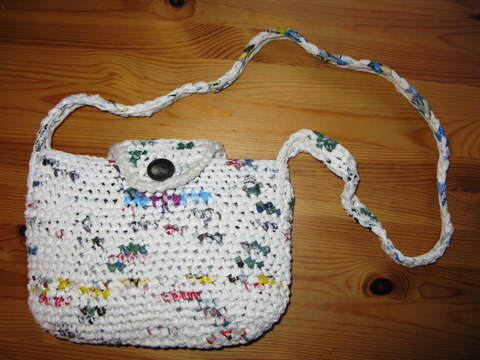 Thanks Roxanna – I have made some little girl purses too. Last year I made 2 for a friend to mail to her great nieces whose dad is stationed in Germany. They loved them. Love your bags, I have tons of plastic bags and am always looking for ways to use them. Do you sell any of your patterns? If so, I would really like more info on what is available, cost, etc. Thanks so much. Hi Gail, so sorry for the delayed reply. This year has been a little crazy (selling my home of 37 years, moving across the country, and welcoming my first grandbaby, etc) so this blog is on hiatus for a little while. Thank you for your inquiry. It’s always nice to see appreciation for my creations. As for making the bags…I generally just work on them with an idea in mind of what I want each one to be. I don’t have written patterns. If you have more specific questions about making bags like this, please feel free to email me. Also look through the archives as I have a few posts that describe a bit more of how I make these bags.